India is becoming an Investment Hub, one can be Millionaire in 20 years by only $1000 per month investment in India – COME MAKE IN INDIA.SELL ANYWHERE AROUND THE WORLD. Previous post: How an investment of Rs.10000 grew to Rs.535 Crores in 34 years? Next post: R.K.Laxman : Happy Birthday To You! India is the fastest growing economy in the world with buoyant investment climate. According to recent trends, India is only second to China in the league of favorite investment destinations. As the Indian economy is developing very fast, it has opened new avenues for Investment. Mutual Funds are the best tools for long term wealth creation. But, the challenge is to identify good and top performing mutual funds that can help you in achieving your Financial Goals.A ‘good mutual fund scheme’ is one that consistently manages to outperform the Category it belongs to and also its Benchmark. 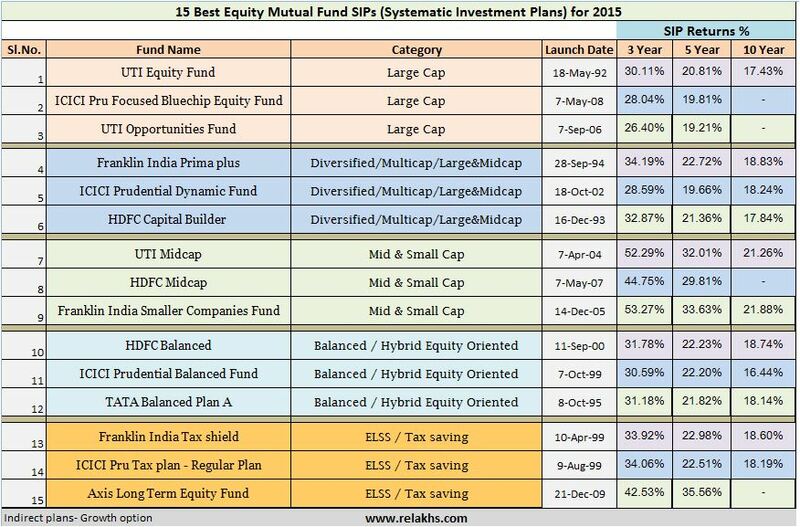 I have taken list from “http://www.relakhs.com/best-top-equity-mutual-fund-sips-in-india” to identify top performing and best Equity Mutual Fund SIPs (Systematic Investment Plans) that you can choose to invest in 2015. Kindly remember, you first need to identify your investment objective, time horizon of investment and risk appetite to arrive at your Investment Plan. Equity Mutual Funds are risk oriented products. Invest in these top performing mutual funds through SIPs (or lump sum) if your time horizon is at least 5 or more years. Following table shows return on $100 per month investment in top rated mutual funds in India through SIP(Systemic Investment Plan).Here,I have assumed dollar rate increment @4% ,considering last two decades scenario.And average rate of return @18% considering investment in Mutual Funds like above.Always keep in a mind that never put your every eggs in a single basket.Invest your fund by splitting it into at least 10 funds like above and invest through SIP only,to balance your risk against market fluctuations.You can multiple investment in $100 denomination and project planning accordingly. ** Above table is for example purpose only.Author is not responsible or liable for any loss resulting from the operation of the Scheme or by the means of their investment advising or accuracy of the data. Disclaimer: Mutual Funds and Securities Investments are subject to market risks and there is no assurance or guarantee that the objectives of the Scheme will be achieved. As with any investment in securities, the NAV of the Units issued under the Scheme can go up or down depending on the factors and forces affecting the capital markets. Past performance of the Sponsor/AMC/Mutual Fund is not indicative of the future performance of the Schemes. As always please consult an investment advisor or financial planner before taking any investment decision.